Google announced that it will retire Google Reader, probably the most popular RSS feed reader in existence, on July 1, 2013. The news shocked many users of the service and made huge waves on social media sites and more or less every tech news site on the Internet. In the day that followed, users created petitions hoping that Google would reconsider the move. Others created huge lists of RSS reader alternatives, and the technical inclined started to work on projects to bring back Google Reader functionality in new and existing products. Google never really answered why it decided to retire Google Reader. The only explanation the company was giving was that usage declined in recent time, but that seems to be an unlikely core reason considering that Google Reader was never promoted and that updates really slowed down in recent years as well. Naturally, usage declined because of that and Google could have steered the wheel around easily. Many tech journalists seem to believe that Reader is terminated in favor of Google Plus, the company's social networking site that its promoting heavily. The idea of moving users from Google Reader to Google Plus may be lucrative enough for Google, considering that it has big plans for the social networking site. Users on the other hand may not be as thrilled and it is very likely that the exodus from Google Reader is not leading the majority to Google Plus, but to other RSS readers instead. The main reason for that is that Google Plus is not like Google Reader at all. While companies and websites post some or even all of their stories to the site, it is lacking features that make news accessible. You can't really get that one-line per news post layout on Google Plus for instance right now to browse a large number of new articles rapidly. What Google may not have considered when it decided to retire Google Reader is that users of the product are for the most part tech savvy Internet users that are part of the backbone of the Internet community. These users read a lot of news items using RSS, and when they are done, they start to take advantage of those news items and spread them around as well. They have already started to create alternatives for Google Reader and while none is replicating Reader's functionality 100% yet, products will come out eventually that come very close to what Google Reader is offering right now. What more? If they have not done so already, they start to see Google in a different light. It is not the company that creates software and services for users. It is a company that tries to make money, one thatt will sacrifice popular products if they stand in the way of that. Realizing that will certainly be a bitter pill for some users. i retired from greader after the announcement. feedly with some good userscript is almost alike and with some polish will be better. retired from gdrive also, it doen’st allow installation on an encrypted drive (because windows doesn’t index it…), or at least that was the explanation. all the others install there without any hassle so as a backup to dropbox installed skydrive and retired google drive. Tried feedly, normal list view is not that great. Got a link to a good userscript that makes it more Reader-like? We need to get away from a company like Google that seeks to monopolize the web. Who knows, perhaps Digg will come up with a much better RSS reader than GReader! Perhaps Feedly will also improve (on an already decent program). For me, the biggest problem is the cross platform support. – One android 2.3.7 phone. – One laptop on Ubuntu. My girlfriend and friends, also use multiple devices. Google reader and syncing is seamless between them. On any PC, you just pop the browser of your choice, log in and start reading, sharing, etc. On the mobile devices, the same. Some recommended and defended “feedly” as a replacement, but it is not – you have to install a plugin in the browser (something some of my friend won’t be able to do in the work computer) just to access the web interface – why?! And I can’t also install on my nook, since there is no apk to android 2.1 (no, there is no possible update from 2.1 to 2.3 or higher). The others solutions are exclusively web based, desktop or mobile based – not both and not in sync. Thought of Pulse but… that tile based interface just doesn’t cut it and I hate it. I want to read the article’s title and at least part of the content’s if not all, before I click to open it. I don’t like list views – they don’t display the contents. 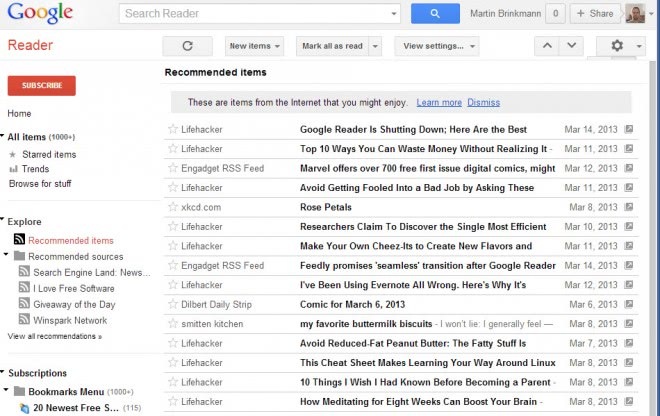 I like Google Reader the way it is and it will be a change in mine and my friends life that will take time to get used. I was shocked by Google’s decision as GR was the first page I opened in my browser ever since GR came onto the scene. Now, I have moved to Feedly and, to be honest, I think I like Feedly even more than GR. So thanks Google; you did me a favour! I don’t have a thing against Google, but their abrupt retirement of Reader just goes to show that they are not a reliable company. They will shut down any of their services without warning whenever they want to. Sure, every Internet service has that clause, but Reader and before that, the removal of Google Dictionary has shown me that Google is most happy to kill services it wants. I’ve moved from Gmail and Drive to Outlook and SkyDrive over the past two days, before I wake up to an announcement that Google is shutting down those services as well in favour in autonomous cars and magic glasses. While Feedly + CSS modding is okay, I don’t really get that space-conserving, speedy simplicity GReader had, anywhere. I’m hoping Digg’s new reader will be more like it, and I’m sure that between now and July 1st, we’re going to see even more RSS readers burst onto the scene. Google isn’t a reliable company, just like Microsoft isn’t a reliable company shutting down services whenever they want, or Microsoft helping the Chinese government to spy on Chinese citizens using Skype with a backdoor in Skype.. It’s all cold business. Don’t be evil. We’re just greedy. Err, did you mean.. Dont be greedy. We’re just evil.. Considering Google has no problem opening up Google+ accounts for every Gmail sign-up, there has to be a way to effectively integrate the one-line feed layout into Google+. All smart companies, from brick-and-mortar to tech, have at least one lost leader, in order to sell their other services. Tying RSS feeds to Google+ would allow easy sharing and likely increase (at least somewhat) the stickiness of G+. I have tried about a dozen alternatives, and have been unhappy with either layout, functionality, feed updating, server latency, memory consumption (clients), or the unknown likelihood of updates. Looks like I will be waiting to see what happens with developers in the next three months. Long ago, dissatisfied with every RSS reader – maybe ten candidates including Google Reader – whether standalone, browser add-on, or web-based, I discovered Blogtottr.com – a free service that turns feed items into emails. In my case (I have Gmail) I set up a label (Gmail’s version of a ‘folder’) just for incoming RSS feed items, plus a mail filter to mark each one as read as it enters. This way I do not get bombarded by thousands of unread messages in the Inbox, thousands of beeping-blinking notifications, These just wait in their tidy little ‘folder’ for me to peruse when I’m ready. Also I can easily star or archive the important ones just like any Gmail message… and (unlike with every reader I tried) make the multi-thousands of unwanted ones vanish forever! I think that underneath the branding switcheroos, though, Blogtrottr is part of a Google affiliate, or something. So who knows about its eternal survival. So far it’s been about three years for me. I use one laptop, period. But it seems to me that if your email account is multi-device-accessible, this’ll give you access via any browser and there’s no further need for synchronizing fusses. Not only the RSS Reader. Google has removed and stopped supporting RSS Subscription Extension for Chrome as well. Feedly is great. But doesn’t feedly actually make use of Google reader to load up the feeds. IAnd I guess unless Feedly development team takes up some alternate step, feedly is also going for a toss along with google reader. While feedly dies use Google reader right now, not only are they working on a replacement called Normandy, they work anyway by just importing your old feeds. Google is just getting plain greedy! They have now removed all ad-blocking apps from their play store too! So making money is the main motto for google now.